Can you believe I’ve lived nine years and I’d never had a bone until last night? Now, I’ve also never weighed as much as I do either, but we’re not talking about that. I went to the dogtor yesterday to check on a little growth on my eye. And, of course, I had to sit on those scales. My eye is fine, but my weight isn’t. Ouch. Dogtor Elliott tells me I’m too big for my frame. Godmother Carol begs to differ. Those who know me know I carry a bit of extra weight from time to time. I was doing really well. Until recently. I prefer to think of myself as a sometimes portly pooch with some winter fat stored up. Scottie weight can vary. A lot. I know some BIG Scotties. I know some small ones. Frankly, I think I’m just right. OK…a tad pudgy, but just right for the most part. So tell me, do y’all eat beef bones? This entry was posted in The Scottie Chronicles and tagged dog bones, dog healthy weight, dogs, healthy Scottie weights, pets, Scarlett O'Hara, scottie health, Scottish Terriers. Bookmark the permalink. OH! Thank you Easy. The eye is fine. I hope all is well with you and yours! No bones for me. Mama is Polly Paranoid…but lots of treats and toys and tummy rubs and on and on and all like that. 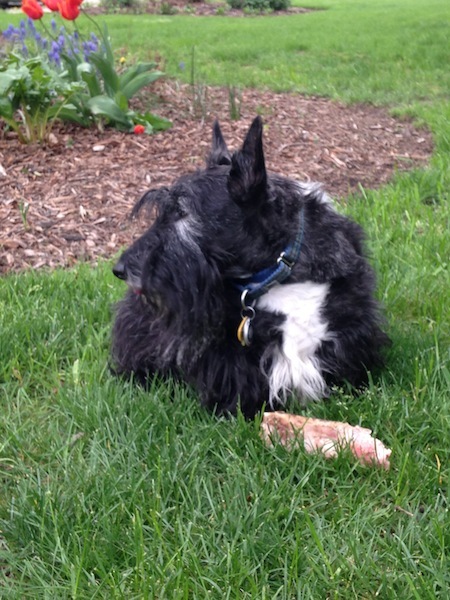 I am a small Scottie, whose tail is screwed up…it’s a stub that hangs down…but as Mama sez, it wags a lot! My tail is screwed up, too! You should take a look at my post about my beginnings. Oh me. So, I can’t spell my own name. That’s Stuart with a T on the end. Geez. Ps, Mama and I love your coat…so handsome and distinctive. And, we are glad your eye is ok! Why thank you! Yeah, the eye is OK. I might have to have a couple of little growths removed. But that’s OK.
There’s just more of you to love!!! Never any doubt about that! Careful! Once they start weighing you and the human starts guilt tripping, you’ll have a diet war on you paws. I’ve been living this nightmare for almost a year. I thought of you when I was on the scales my new pal. The bone was from the peep’s HUGE steak dinner for Her barkday. She was nice enough to bring it home for me. I ate some of it, then She took it away saying We’re saving the rest for later. I think She’s worried about it being bad for me or the bone splintering like chicken bones. But we all know chicken bones are bad for us because of that very reason. Huumm……. But I’m none the worse for wear today after eating half of it last night. About my weight. The Dogtor and my Godmother disagree about it. One says I’m perfectly fine because my father was built like a Mack Truck. And one says I’m doing harm to my back and my feet because I’m carrying too much weight. I’ll keep you posted about this my Edgar pal. Run the marathon, that’ll take some off you. We birds are perpetually concerned about weight. Too much and we can’t get off the ground. I bet you weigh so much you can’t get off the ground now. Time to see Jenny. OH. Off the ground would never suit me. Unless you swooped in and took me for a ride. Make that “gave me a lift”. In the winter since its cold and the peeps do not like to walk me in the cold I put on the weight. All the peeps fault but then I have to go on diet to cut down the weight. I have never had a real uncooked bone. We walk all year. Even in the rain. But even then I carry the weight. The peeps argue about it and it’s not pleasant. My bone was from a BIG porterhouse steak. Yum. I think a bit extra is like an ounce of prevention. What if you got sick and couldn’t eat, what if the zombies overtook the world and ate all the food……at least we’d have something stored up to get us through. Just sayin’. This summer you’ll be more active and it’ll all come off. Now, about the bone–we are soooo jealous. SHE is too paranoid we’ll choke, so no bones for us. But you enjoy! Yeah, the peep wasn’t too sure about that choking thing, but figured as many sticks as I chew up and eat, maybe a bone wouldn’t be so bad. Go figure! Oh what the He**! I have already insulted two people today guess I will go for a third ~ your doctor verses your Godmother Carol. Lee’s last Scot Half Pence which she does not talk about much well was quite the looker with the long skirt down to the floor. He was in show and won around here and appeared on calendars you buy at the malls. Well are vet also told Lee his weight should come down and the next show after the weight loss Lee were told by all the breeders that he was to thin. He was much healthier and Lee was able to keep his Cushings under control being stocky. Scotties are suppose to be broad and sturdily built! But no fat rolls. “Praise the Lord and Pass the Ammunition” because I am probably going to hear from someone on this comment. Praise the Lord and Pass the Ammunition! OH MY DAWG!!!! Can I use that? I LOVE IT. You won’t get any comment from me Lee and SWTS. Love you both. PeeS Keep those insults coming. It makes life special. OH. Such a good thought. I gotta be burning calories that way, yes? When I went to go see da momma’s grandpeeps last week, dey kept commentin on how much more I weighed dan Finley. It could give a girl a complex. But I’d rather be given a bone. Come on over. I’ll share mine. We’re glad your eye thingy is not a problem, Stuart. The weight thing sounds like much ado about nothing. Besides, with the nice weather now you will get more exercise and trim down a bit. Not that you need to, it just will happen. Since I am with this Peep, 2 years in May, she’s never given me a bone. She does make up for it with doggie treats, baby carrots and lots of belly rubs and kisses. I really can’t complain. I don’t think I’ll get many more bones. Baby carrots! Yaaah! The biggies weigh about 24 lbs. Sophie is still growing. I bought sterilized bones many years ago and they are still in the house. I don’t do meat or meat bones. Me neither. This bone was a one time thingey. I thinkey. Well Stu, we can’t agree with you more. I (Wally) am a larger Scottie, both in size and weight, although I have dropped a few pounds. Now tell us your thoughts on your first bone! the people give me cow knees sometimes from the store. I think they are cooked, or smoked. Yummy good! As for weight, the very 1st dogtor I saw after being freed from the little cage said I was fat at 16 lbs. It was a good thing she thought I was fat, as I was really sick (stupid dogtor didn’t notice that) and got down to 9 lbs. I am now 17 lbs of all Scottie and no one says I am fat! Uh oh… I hope that doesn’t mean you’re on a d.i.e.t….